Marathon Grill will host its first ever "Farmraiser" on October 12. The dinner will support Kensington's Emerald Street Urban Farm and feature four courses spotlighting the seriously mouth-watering combo of fresh veggies from the farm and Philadelphia Brewing Company suds, paired with each course. One hundred percent of the proceeds from the dinner will go directly to the farm. Reserve your spot for this delicious dinner fast. Tuesday, October 12, Marathon on Chestnut (1339 Chestnut St.), $45 per person (not including tax and gratuities). For reservations, email farmraiser@marathongrill.com or call 215-282-1505. Have your credit card ready when calling. Emerald Street Urban Farm Project is a neighborhood-run urban farm/garden founded by Elissa Ruse and Patrick Dunn in 2009. Patrick and Elissa joined with their neighbors and reclaimed 5 vacant lots on the corner of Emerald and Dauphin Streets. The space was originally filled with trash (including a broken VW van) and overgrown with weeds. Now there are 5 raised beds, hosting all kinds of produce. In 2010, there are plans for planting a mini orchard and perennial berry, herb and flower garden. Also, in 2010 one bed was opened up to community members and 4 plots were created for personal gardening. ESUF holds farmstands every other Saturday on location. In addition, they hold workshops and events on a monthly basis. 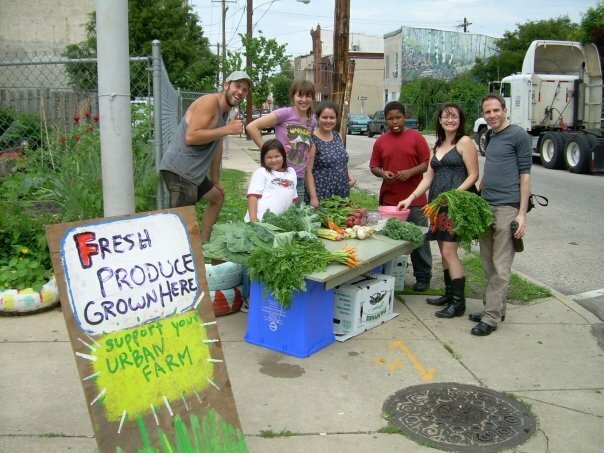 Through community outreach and education, ESUF hopes to directly connect people to the food they eat and the neighbors they share it with. Love is in the Veggies! Come grow some Love with us!